Agricultural science looks at the science or practice of farming, including cultivation of the soil for the growing of crops and the rearing of animals to provide food, wool, and other products. Study the following Agricultural science past questions and answers for JAMB, WAEC, NECO and Post UTME. Prepare yourself with official past questions and answers for your upcoming examinations. 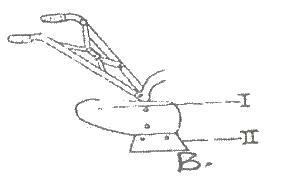 The diagram above shows parts of a plough. Study it and answer this question. In agriculture, a plough is a tool or farm implement used in farming for initial cultivation of soil in preparation for sowing seed or planting to loosen or turn the soil. A ridging plough is used for crops, such as potatoes or scallions, which are grown buried in ridges of soil using a technique called ridging or hilling. A ridging plough has two mouldboards facing away from each other, cutting a deep furrow on each pass, with high ridges either side. In agriculture, according to Wikipedia, a plough is a tool or farm implement used in farming for initial cultivation of soil in preparation for sowing seed or planting to loosen or turn the soil. A ploughshare is a component of a plough. It is the cutting or leading edge of a mouldboard which closely follows the coulter (one or more ground-breaking spikes) when plowing. Which of the following functions is not associated with the part labelled I? A farmer bought a farm implement for ₦12,500 in 2007 . At the end of the fourth year he sold if for ₦4,300. Use information to answer the question. Which of the following equipment is a farm implement? Which of the following sources of farm power is most verstile in West Africa?